The College of Education and student organizations SABE and B-BEST will host the For the Love of Language Celebration on Thursday, March 30. It’s free to attend, and the deadline to register is March 22. The Love of Language Celebration was created to jumpstart the conversation on cultural identity and language at Illinois State, creating a more equitable experience for all Redbirds. It is part of a faculty and student-led committee effort in the College of Education called IDOMA, or Inspiring Dialogue about the Importance of Multilingualism Multiculturalism and Asset based perspectives. “True to Educating Illinois, we believe that ‘The more voices we call into thoughtful dialogue, the truer our convictions and conclusions will be,'” said Sara Jozwik, IDOMA committee member and assistant professor in the Department of Special Education. Following Beeman’s presentation, there will be a reception with refreshments and prizes. Attendees will also connect with community organizations that support language development and/or multiculturalism. This event is sponsored by the Harold K. Sage Foundation, the Illinois State University Foundation Fund, and the Council for Teacher Education. 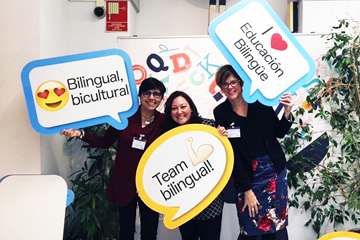 It was organized by IDOMA, SABE, or Student Association for Bilingual Education and B-BEST, or Best Practices for Bilingual English as a Second Language Special Education Teachers.